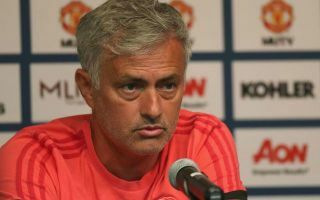 Manchester United manager Jose Mourinho has admitted he doesn’t know when Anthony Martial will return to his squad as the start of the new season looms. The Red Devils kick-off the new campaign against Leicester City in just nine days’ time and Martial has had to leave the club’s pre-season tour to attend the birth of his son. The France international’s future at Old Trafford had already looked uncertain after his agent told RMC earlier in the summer that he was looking to quit the club. This followed Martial struggling to play regularly under Mourinho in the last two seasons and it perhaps seems unlikely that he’ll establish himself in the side if he continues to go walkabout ahead of the start of the Premier League. United are already due to be without Romelu Lukaku and Marcus Rashford up front due to them both making it to the World Cup semi-finals with Belgium and England, respectively, so could do with Martial coming back as soon as possible. What next for Anthony Martial at Manchester United? The 22-year-old did not go to the World Cup with eventual winners France, so would have been in line to get some immediate first-team action and the chance to make a real impression at the start of this season.